Head Quarter Qasim Army Aviatoin Base Dhamyal Camp Rawalpindi has announced Latest Jobs in Daily Express Newspaper. Lower Division Clerk (BPS-09) 01 Post, Driver (BPS-04) 01 Post, Fire Crew (BPS-02) 01 Post, Mali (BPS-01) 01 Post. Candidates who have required qualification can send their application on GPO Post Box No 6814 Rawalpindi Till 26 January 2018 with all Attested Documents. Mobile Phone Number should be written in application so, you are informed for test interview through call or SMS. Head Quarter Qasim Army Aviation Base Dhamyal Camp Rawalpindi 04 Jobs, 05 January 2018. 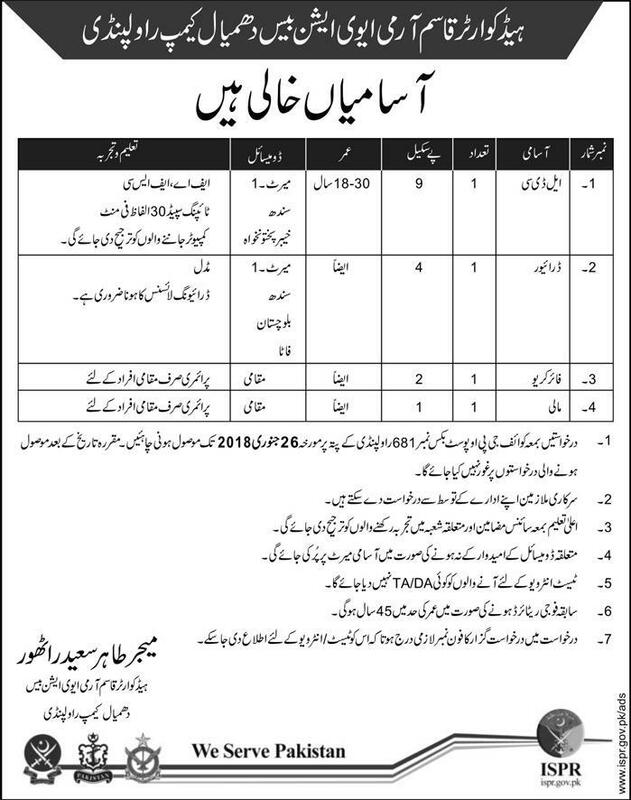 Pingback: Sindh Regiment Center Hyderabad 14 Jobs, 07 Jan 2018 Daily Express.